Keane are an English alternative rock band from Battle, East Sussex, formed in 1997. 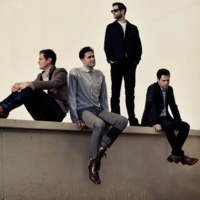 The group currently comprises Tim Rice-Oxley (piano, backing vocals), Tom Chaplin (lead vocals, guitar), Richard Hughes (drums, percussion) and Jesse Quin (bass guitar, percussion), who joined in 2008 as a permanent studio member and performer. Their original line-up included founder and guitarist Dominic Scott, who left in 2001. It was announced on 3rd February 2011 on the band's official website that Jesse Quin had become an official member of the band. Keane achieved mainstream success with the release of their debut album, Hopes and Fears, in 2004. The album won multiple awards and was the second best-selling British album of the year. Their second studio album, Under the Iron Sea, continued the band's success, topping the album charts in the UK and debuting at number-four on the Billboard 200 chart. Their third album, Perfect Symmetry was released in October 2008. In May 2008, both Hopes and Fears (#13) and Under the Iron Sea (#8) were voted by readers of Q magazine as among the best British albums ever, with Keane, The Beatles, Oasis and Radiohead the only artists having two albums in the top 20. Their fourth record, Night Train, was released in May 2010, debuting at number 1 on the UK Chart and at number 25 at Billboard 200 US chart. Keane are known for using a piano as the lead instrument instead of guitars, differentiating them from most other rock bands. The inclusion of a distorted piano effect in 2006 and various synthesisers were a common feature in their music that back then combined the piano rock sound used during their first album and the more electronic sound which developed on the second and third albums. Since the start of their career, the band has sold over 10 million albums worldwide. From their album Perfect Symmetry in 2008, they included the electric guitar, making the sound of the band much more varied, but not leaving aside the traditional piano.